We know that many of you have been waiting for an Autoresponder feature in GroupMail for some time; so we are very pleased to announce that you can now create and manage email marketing drip campaigns with GroupMail. 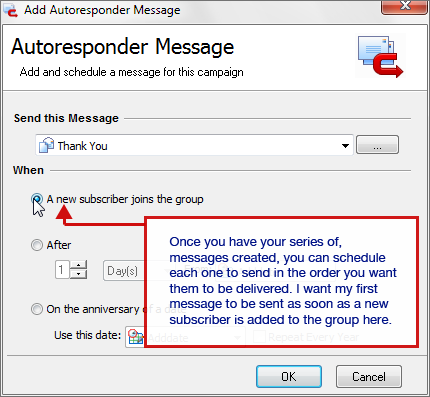 The GroupMail Autoresponder allows senders to create a series of emails and schedule them to send to new subscribers in sequence over a period of days, weeks or months. For more information and instructions, read How to Send Automatic Email Drip Marketing Campaigns with GroupMail Autoresponder. The GroupMail Autoresponder is available in both the GroupMail Business and Marketing Pack Editions. Existing GroupMail Business and Marketing Pack customers can download the latest version from the GroupMail Customer Area. GroupMail Personal Edition customers can upgrade at any time and just pay the difference in price between editions. You can upgrade from the Help menu in GroupMail or by visiting the GroupMail Customer Area.